Pastoral couple, pillars, and others make a difference. CREIGHTON, Sask.—We are so thankful for Pastor Randall and Faith Krahn. The combination of insightful sermons and musical gifts that they share with us is very much appreciated by all. Lorne and Margaret Moorhead continue to be pillars in our church. Margaret has been dealing with some health issues and we ask that you keep both Lorne and Margaret in your prayers. Marg Cone, another pillar, has also needed periods of rest and we are so thankful for her. We continue to share our pastoral couple with the Cornerstone Community Church (MB) in Flin Flon and there have been Sundays when we combine services. Joe Buie at Cornerstone has been helpful in helping us plan our Sundays. On May long weekend we met at Simonhouse Bible Camp for Sunday service. Former pastoral couple Dale and Marge Warkentin shared with us on May 28. It was good to have them in our midst once again. On June 11 we had a combined service at the Rotary Wheel where we sat around the fire and roasted hotdogs. 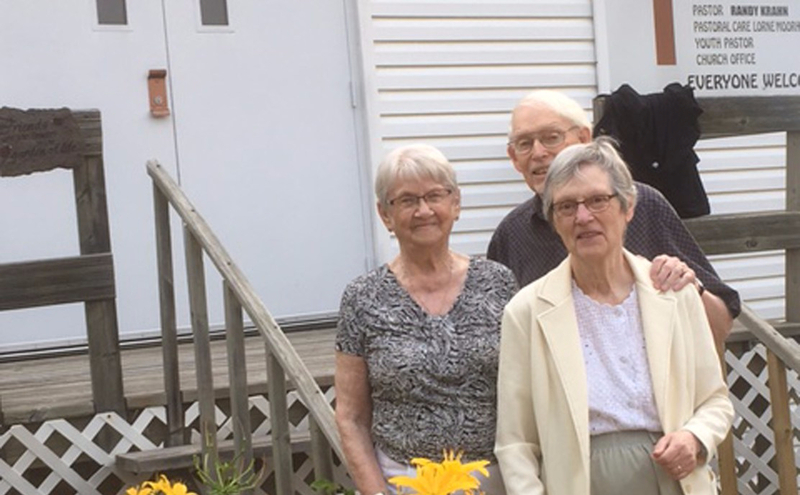 On July 2, the Sunday during the Homecoming in Flin Flon, all churches in our area had a combined service at the Lutheran Church. On July 9 Trevor Friesen came to NFC while Rebekah rested at the lake with sister Sara Lynne and Dave Koop. They have moved back to Canada and are now settled in Rosenort. We pray for the restoration of Rebekah’s health and for their re-adjustment in Canada. On July 23 we had a combined service when the Simonhouse Bible Camp staff came to share their experiences; and in August we will meet together when Nathan and Emily Willems come to share with us before they go with their family to Papua New Guinea within the following year. Our Kids Club has grown this past year. Children come after school on Tuesdays, and we have had 35 on our roster with an average attendance of 21. The hour keeps us hopping with hot chocolate, snacks, crafts, story, game and music. Judy Schmidt has graciously come from Cornerstone to help with snacks. We have appreciated Austyn Davis, a young student, who has come to give a hand. As well, Randall, Faith, Janice, Kristen, Fae, and Yvonne come out to help with clean up, dishes, and helping here and there. Snow removal, grass cutting, and cup washing somehow gets done by those who almost do these jobs in secret! I do believe that the “behind the scenes” workers are Randall, Lee, Yvonne, Shawn, Barb, Lorne and Jerry. Tom Fehr brings his mother Helen, and we are so glad she moved here from Carrot River. We appreciate Mike and Deanna Anderson for their presence whenever their work shifts permit them to come. Evelyn (four years old) and Ollie (one year old) continue to enlighten our Sundays and they also enjoy puppets Froggie (Kevin) and Susie (Kristen). Kristen Imrie often leads the singing, accompanied by Faith at the piano, and Kevin Imrie usually treats us to violin at the closing congregational song. In closing, I also want to extend a huge thank you to our EM Conference for their continued support. We miss Ward Parkinson who was always so supportive of us up north and say thanks to Ralph Unger, our interim conference pastor. We look forward to meeting with Layton Friesen, who has been appointed conference pastor and began his position this fall.